A connection between my daughter and a Holocaust survivor. The story behind the book cover of Train. "How old are you?" the high school student asked, and his peers gasped and laughed at his blunt question. The old woman, with her silver hair and a wry smile, stood at the front of the school auditorium. She gripped the microphone with both hands. "I'm fifteen," she replied. The students' giggles faded as the woman continued. "My childhood ended, at age fifteen." She had said goodbye to her parents and sister at age fifteen, she told them. All alone, she had moved to a farm to live with strangers, at age fifteen. For four years, starting at age fifteen, she had pretended to be a "deaf mute" so as not to reveal her intellectual, Jewish upbringing. This was the first time I had met Ava Kadishson Schieber, an artist, the author of Soundless Roar, and a Holocaust survivor from Novi Sad, near Belgrade. Ava invited me to her home, an apartment overlooking downtown Chicago. Each room was filled with a lifetime of her artworks, oil paintings, ink drawings, her memories, the friendly ghosts of her sister, lost in the war, she explained, of her father and grandmother, murdered in the gas-chambers of Auschwitz-Birkenau. We talked about our overlapping work, our experiences as Holocaust educators. We became friends. I read Ava's stories and began teaching her incredible book. Over the years, I observed Ava speaking to groups of teenagers. And training teachers. Ava visited my classroom and I took my daughter, Miriam, to visit Ava's home. Ava encouraged Miriam to examine her belongings, her treasures, old vases, figurines. Miriam gazed up at Ava's paintings. Ava spoiled Miriam with sweets. When Ava asked me to be the editor of her second memoir, focusing on the post-war years and post-war memories, I said yes. We sat side by side for many months, her artworks surrounding us, working through her stories, line by line, talking through her life experiences, pairing her drawings with her stories and poems. Once, Miriam visited, too. As Ava and I worked away, Miriam played under the table and gobbled Ava's chocolates. If I'm honest, I worried what Miriam could understand of our conversation. I turned to Ava and out spilled a burning question. "When did you tell your children about the Holocaust?" "When they asked," was Ava's reply. I gave Ava an almost completed draft of my novel, Train. I was both eager and nervous to hear her critique. What would a survivor of the Holocaust think of my story? The tale of a group of teenagers trying to escape the Nazi round-ups, including a fifteen year-old-girl who promises herself that, if she solves a mysterious treasure hunt, her brother will be saved. Had I represented accurately the voices and attitudes of wartime teenagers living in hiding, separated from their parents, experiencing trauma, doing everything possible to survive? Days later, Ava called me and invited me over for hot chocolate to hear her feedback. She pulled out an old drawing of continuous lines turning into entwined faces and figures and reaching hands and bowed heads. She asked me to consider the drawing for my book cover. I stared at the image and, although Ava had likely drawn it years earlier, I saw within it the story of Train. I wanted to ask Ava why she chose that particular drawing. But I kept the question to myself. By now, I knew Ava well. She would only avoid my query, leaving me alone with my own interpretation. 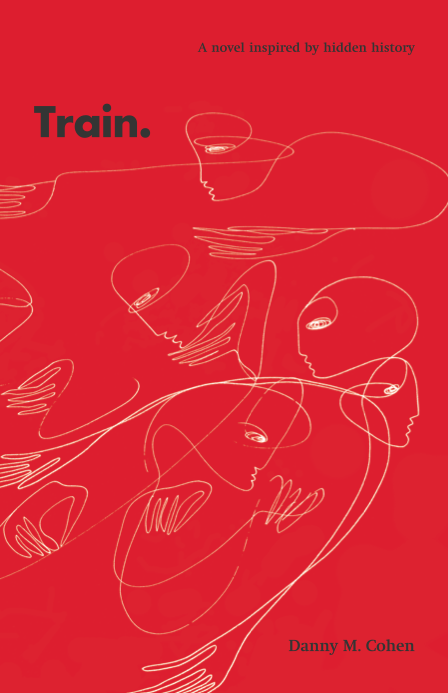 I would place Ava's artwork on Train's cover, as well as include the full image inside the book, inviting my readers to consider their own interpretations and questions. That is always Ava's intention. Excited, I took the artwork home. "That's Ava's drawing," said Miriam, now almost age five. "You recognize it?" I was amazed. I scanned the image and uploaded it onto my laptop. I played around with the book cover design. Miriam was watching me experiment with the placement of Ava's drawing. "Daddy, I don't like it." Miriam pointed at the screen. The black lines of the drawing sat behind large grey typeface, all on a stark white background. "It's not colorful. Can you make it colorful?" "Sure." I clicked on the image and began to adjust its properties. "What color would you like?" "Daddy, try blue ... Awesome, I love that! Now, try purple ... Cool! ... Now, try pink." As I adjusted the colors, the screen froze. Together, we stared at the screen. "Daddy, I like it red." I took my laptop to Ava's home. I felt anxious. What would Ava say that I'd manipulated her drawing? Her artwork, the simple black lines of interlocking figures, faces, limbs, across their empty white pages, empty spaces. Now changed. For a moment, I held my breath. "What do you think?" Ava smiled. She pointed to a painting that hung on her living room wall, above us. I'd seen the painting many times. But the red paint running through the repeated colorless figures had never captured my attention. Until that moment. "Red." Most people associate red with death, with violence, Ava said to me. "But red is life."